At a recent regional event, the Dane G. Hansen Foundation announced a commitment to infuse up to $150,000 in new funds in each of the 26 counties in its service area. The foundation’s total commitment for this initiative will be a minimum of $2.6 million and a maximum of $3.9 million. Funds will be disbursed in each county through its community foundation or grant advisory committee. 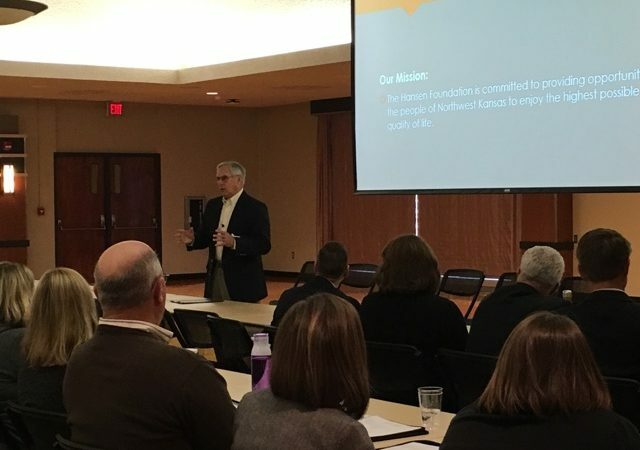 The announcement of the additional dollars was revealed at the Foundation’s first ever Community Foundation Forum in Hays, on March 16. More than a hundred community -minded people from across Northwest Kansas gathered for the event. Attendees included representatives from community foundation boards, grant advisory boards, economic development professionals and other civic professionals from the Hansen Foundation’s 26 county service area. At the Forum, the Trustees announced the commitment to renew grants in the amount of $100,000 to each county for projects to be determined by local community foundations or advisory boards. In 2015, the Foundation made similar awards to community foundations to provide available grant dollars in each county. $50,000 was awarded in April and again in September. The dates will be the same for 2016. In addition, Trustees announced a new initiative designed to encourage the growth of permanent funds in each county. Each community foundation will select a particular month in which it will host a matching event or campaign. For the selected month, the Dane G. Hansen Foundation will provide a 100% match for every dollar raised for the participating community foundation’s endowed unrestricted community grant fund, up to a maximum of $50,000 per county. Matching dollars from the Hansen Foundation will be also be added to the participating community foundation’s endowed unrestricted grant fund. For counties that do not have a community foundation, the Hansen Foundation will provide a matching grant, following the same guidelines and process, for a permanent grant fund, restricted for that county, to be held by a host community foundation. In addition to the funding announcements, the event included sessions on community vitality efforts (Nadine Sigle) board recruitment (Bill Riley) and the grant review process (Betsy Wearing). In addition, Trustees shared information on new and renewing initiatives for community foundations. Scott Sproul, the new President of the Northwest Kansas Economic Innovation Center, shared information about the work this new organization will be doing. Attendees also enjoyed a presentation on the life and history of Mr. Hansen.